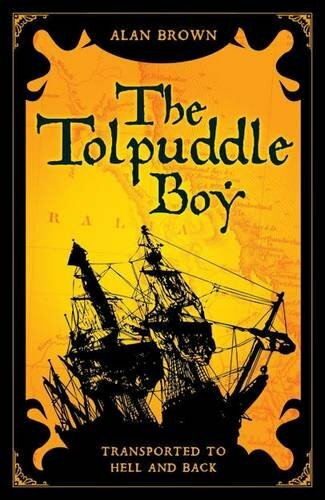 First published in 2002 by Hodder Children’s Books, this is a factual account of the Tolpuddle Martyrs who were sent to Australia as convicts in 1834. The narrative concentrates on James Brine, one of the men, following his story through the court case, the voyage to Australia and his treatment there and the subsequent pardon of the men, which was won by the nationwide campaign to pardon them. The conditions in which the working class lived in those times are clearly explained, and the rather complicated legal case, with the charge of taking secret oaths binding themselves to the union, is also clearly laid out for the reader. There is a great deal of information within the text for the reader to absorb which makes for slightly indigestible reading, and makes the story somewhat like a textbook. There are many quotations from the time, and tables of various costs to illustrate the difference between then and now. At the end of the book there is a Timeline, glossary, list of sources and an index.